Line a small, flat pan with aluminum foil. 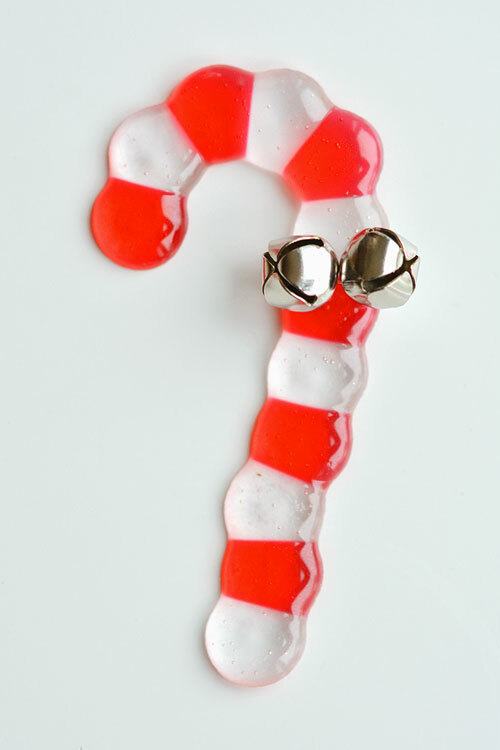 Arrange the beads in a candy cane shape, alternating colours as you go. Remove the pan from the toaster oven when the beads have completely fused together, but before they flatten completely or start to bubble. Leave the beads outside for a few minutes to let the smell dissipate. Then place the pan in the fridge or freezer for 10 more minutes to fully harden. Thread two jingle bells onto a piece of fishing line and tie a small knot to keep them together. Then tie the fishing line around the candy cane and tie a knot. If you're using these as Christmas ornaments, tie on another piece of fishing line to use as a hanger.